With some of the most picturesque landscapes in all of the Santa Monica Mountains, Malibu Creek State Park is an excellent place to hike. 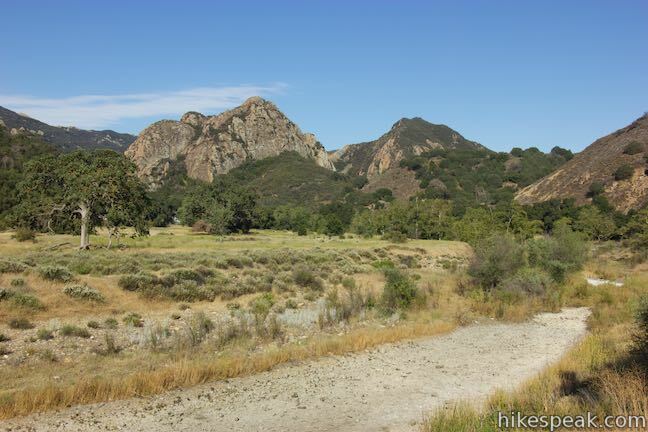 Many miles of hiking trails explore the over 8,000 acres protected by Malibu Creek State Park. Before it was a state park, movie studios operated filming ranches on this land, using the cinematic scenery for over a hundred projects, including Planet of the Apes and M*A*S*H. The well preserved and restored MASH site is a popular hiking destination. Rock Pool is an equally popular target for hikers, particularly on warm summer days. Woolsey Fire Update: Malibu Creek State Park has reopened following the November 2018 Woolsey Fire. The state park quickly reopened the Tapia Traihead after the fire. The main area of the park, although badly damaged, reopened in late December 2018. The reproductions at the MASH site were ruined by the wildfire. Numerous structures within the park were destroyed. Check the Malibu Creek State Park website for current visitor information. Malibu Creek State Park is located in Agoura Hills, Calabasas, and Malibu, about 27 miles from downtown Los Angeles. The park preserves much of the Malibu Creek Watershed, the largest watershed in the Santa Monica Mountains. Malibu Creek State Park is a few miles inland from the Pacific coast, with a ridge of 2,000-foot tall mountains along the south side of the park. Mesa Peak Motorway, a segment of the Backbone Trail, crosses this ridge. On the north side of these mountains is a legendary park landform, the Goat Buttes. These bold volcanic rock formations make dramatic backdrops for many Malibu Creek State Park trails. Want to spend the night? 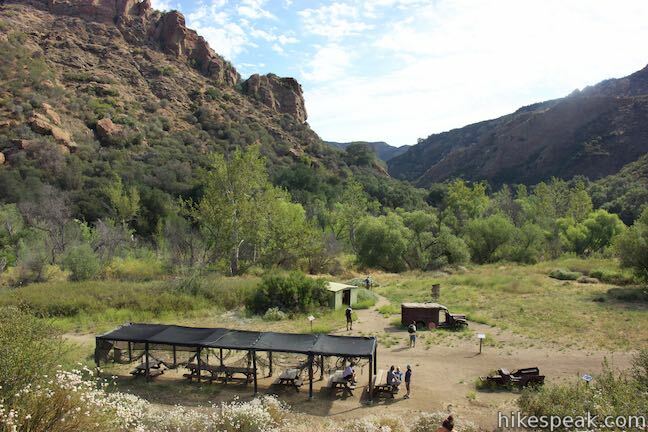 Malibu Creek State Park has one campground with 63 sites that can be reserved in advance. Learn more about the Malibu Creek State Park Campground. Malibu Creek State Park has one park entrance with a large parking lot. A vehicle fee is charged for this area of the park, which offers convenient trail access. Hikers can also set out from other spots with free roadside parking. The entrance to Malibu Creek State Park is located on the west side of Las Virgenes/Malibu Canyon Road between Highway 101 and Pacific Coast Highway. Coming from the end of Interstate 10 in Santa Monica, take PCH west for 13 miles. Turn right to head inland on Malibu Canyon Road, which becomes Las Vigenes Canyon Road. Drive 6.1 miles from PCH and turn left into the park entrance. Coming from Highway 101, take exit 32 for Las Virgenes Canyon Road and travel south for 3.5 miles to the park entrance, which is on the right just after Las Vigenes Canyon Road crosses Mulholland Highway. Malibu Creek State Park is part of of a patchwork of parks that make up the Santa Monica Mountains National Recreation Area. Paramount Ranch, Solstice Canyon, and Corral Canyon are highlights among the nearby places to visit. These hikes are listed roughly from west to east and north to south. Sort the list alphabetically or by distance to pick the trail for you. The listed hikes link to write-ups with complete descriptions and directions as well as GPS maps, elevation profiles, and lots of photos – everything you need to get out and explore these trails!